It’s official, Mr Hobbs is welcoming Christmas with open arms! We have recently been at several festive events including the magical Waddesdon Christmas Fair. The event is running until 16th December so if you haven’t visited already, there’s still time to go get those last few prezzies (or maybe even the first few, depending on how organised you’ve been this year!). We were there for the second week (21st Nov-25th Nov) with all our products including the brand-new gin and orange chocolate truffles we have recently launched with local chocolatier Gorvett & Stone. These chocolates are stunning, we’re so pleased to be part of this new Henley partnership and can’t wait for you all to try them. If only there was a way of popping a little sample in this blog, maybe one day! Just imagine yummy chocolatey, orangey, velvety truffles with a little Mr Hobbs Gin in the mix and topped with orange rind ‘garnish’- very moreish, we could try and suggest buying them as gifts, but you would be excused for keeping them all to yourselves in our humble opinion. 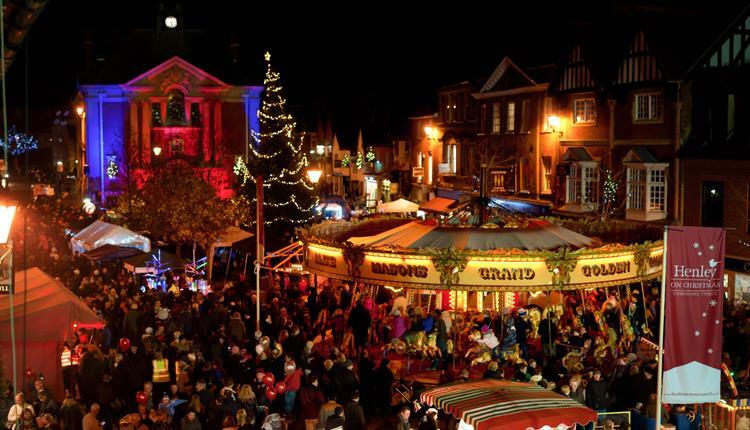 Friday 30th November marked the Henley Christmas Fair, where we saw the town lights switch on and were serving our Spiced Apple Warmer, featuring lots of Christmas cheer and Mr Hobbs Gin. Perfect for this cold Winter we have ahead and maybe something you want to try at home with friends and family over the Party Season! We still have some Santa Cruises to look forward to at Hobbs of Henley as well as our Christmas Party Nights and Lunches- check out dates and availability here. The ever-popular Santa Cruises feature the fantastically entertaining Bertie Slippers – along with the red-clad man of the moment, Santa Claus himself. You know what they say, you’ve got to believe to receive! If we don’t get the chance to say it personally between now and the day itself, we wish you a Merry Christmas and a Happy New Year- May your days (and gin filled evenings) be merry and bright. Thank you so very much for your continued support of our cherished family tipple and we look forward to enjoying even more Mr Hobbs Gin with you in 2019.